Are Your Generation Projects Ready for G98 and G99? If you work in power generation in the UK, whether that is thermal, solar, wind, hydro or any of the other technologies. You are probably aware that there is a new standard coming into force called ENA G98 and ENA G99. These new standards will radically alter the design and planning process of all new generation projects, and make life much more challenging for schemes >1MW. If you would like to know more about G99 and how it affects your business. Then please read on!! ENA G98 and ENA G99 are the two new standards coming into force affecting generating plants that will be connected to the UK distribution network from 27 April 2019. G98 replaces G83 and G99 replaces the G59 standard. These new standards will radically affect the connection and agreement process for all new solar, wind, battery storage, CHP and thermal generation plants that are planned for connection. The standard also now addresses integration of battery storage technology. This blog post is intended to discuss the technical aspects and changes to the connection process and does not delve into the commercial or legal implications of the changes. As with the previous standards G99 is applicable to generators with a rating above 16A/ phase, and G98 applies to generators with a rating below 16A/phase. This blog post will focus on the G99 standard, as this is the more complex standard, and will affect the majority of SPE’s Clients. G99 – Who Will be Affected? The companies likely to see the biggest changes and challenges are smaller companies who develop of medium sized generating facilities rated at more than 10MW, as these will face lot more complexity in the design process. Developers of sites rated between 1MW and 10MW will see some changes and new design issues and challenges, but there should be no fundamental shifts. Developers of smaller sites rated under 1MW should see minimal disruption. The majority of the focus is, as expected, generators that operate in parallel with the grid. Short term parallel and standby units are excluded from the majority of all of the performance requirements. Practically, there is a lot of changes for dedicated generators, but for standby / emergency power, or equipment designed only for short term parallel operation, the standard remains very similar to the older G59 requirements. Why the Change from G59? So, first of all why the change? The simple answer is that the amount of embedded generation connected at 11kV, 33kV and 132kV has far exceeded expectations, and many of the larger traditional thermal generation plants are mothballed or nearing the end of their life. This has shifted how electricity is generated and distributed, and pushed the DNOs like UKPN, WPN, SSE, NPG, SPEN and ENWL into a role where they need to actively manage their network in a way they haven’t needed to before. From a nationwide point of view to have an effective power generation network, it must be controlled actively with local generation matched closely to local demand to keep the electricity supply stable and within the necessary performance criteria. The new rules have therefore been implemented to enforce new performance specifications on smaller scale generators connecting at theses lower voltages. The biggest changes affect projects that are greater than 10MW or are connected at 132kV – although in practice connecting a project <10MW at 132kV would be very unusual. The new G99 standard brings with it lots of new definitions and acronyms. The most important of these are summarised below, they can be a little confusing as there are a lot of similar terms that overlap. Power Generating Facility – A facility that is connected to the DNO network and contains one or more Power Generating Module. Power Generating Module – A generating unit inside the Power Generating Facility. This can be either a Synchronous Power Generating Module or a Power Park Module. Generating Unit – Any unit that produces electricity. Frequency Sensitive Mode (FSM) – A mode of operation (Type C and D only) where the generator should adjust their output in response to frequency deviations in order to help the grid recover. Fault Ride Through (FRT) – The ability of the generator to remain connected to the grid during system disturbances such as voltage depressions. Limited Frequency Sensitive Mode (LFSM) – A mode of operation, where the generators power output should remain constant despite frequency deviations. Rated Capacity The normal full load capacity of a Power Generating Module, or of a Power Generating Facility, as declared by the Generator less the MW consumed when producing the same. Generation that performs different functions, also have different requirements and is now split into three classes, depending on their role. In practical terms Type C and Type D are treated in a similar manner for design purposes. Type D connections are notifiable to National Grid and have additional Grid Code compliance issues and additional testing and witnessing requirements. To further complicate matters, there are another set of thresholds, where if the overall Power Generating Facility, exceeds certain power thresholds based on its location (N. Scotland, S. Scotland or England & Wales). Then the National Grid Code will also apply. The next section talks about each of the generation Types in turn, and the key requirements of each class in general terms. Performance & Control – Generators will now need an input signal from the DNO to stop generation, which must occur within 5s of signal receipt. Type B generation systems will be broadly similar in design and application to the general requirements defined in G59. The big changes are that the manufacturers design and specification will need to improve, additional power system studies will be required to demonstrate compliance and there will SCADA interfaces to the DNO. Type C & D generation systems will see a large change and face a number of more significant design challenges. 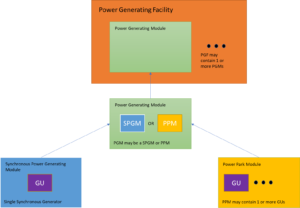 This will result in more power system studies being required to demonstrate compliance, complex controllers and interfaces to the DNO and an increased need for reactive power compensation equipment. The following table summarises the main issues associated with each Generation Type. The following give a list of typical projects that would be covered by the rules, and which classification they would fall under. So What is the Impact To a Developer? Type C schemes (>10MW to <50MW) – There will be a lot more studies to do, equipment will need to be a higher specification, reactive power compensation equipment will often be necessary and there will be need for more complex communication and control equipment. Hopefully this article has given readers some understanding of the changes coming with the introduction of G99.In general life will be more complex, and as previously some certain types of projects and power ratings will be more viable than others. The general impact will be more study and design work is required in the early stages of a project and the DNOs will have to take a more active interest in the projects. A word of warning, the G99 standard is very new and this article is based on SPE Electricals’ understanding of the code. It is likely that once the code is in force and applied in detail, there will be many changes and clarifications on certain issues. So don’t assume that the standard is fixed! Lastly, this post is only intended as a brief guide to G99 and should not be regarded as exhaustive – if you would like to discuss your upcoming projects, please do not hesitate to get in touch.